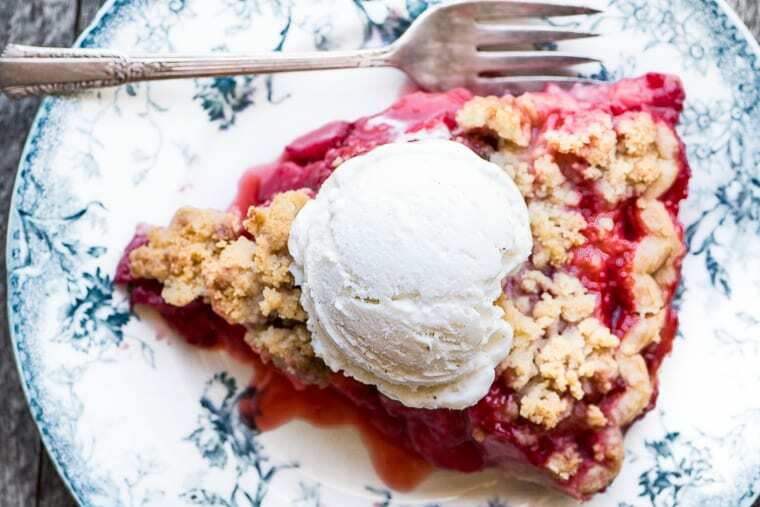 Strawberry Crumble Pie ~ you’re not likely to come across another pie that screams spring quite as loudly this one…if spring were a pie…well, you get the idea. This is one fruity, juicy, and berrylicious strawberry dessert you won’t want to miss. Certain pies get all the glory, like blueberry, apple, and cherry. As a cook I like to go with the underdogs…have you seen my APRICOT PIE? How about my CRANBERRY PIE? You won’t see them coming and going, and yet they’re amazing. Ditto this strawberry pie. And I’m not talking about the kind of deal where they just pile ginormous raw strawberries into a crust and call it pie. This is real honest to goodness hot jammy berry pie, with a buttery crumble topping and a big scoop of vanilla melting all over the top. Amen. 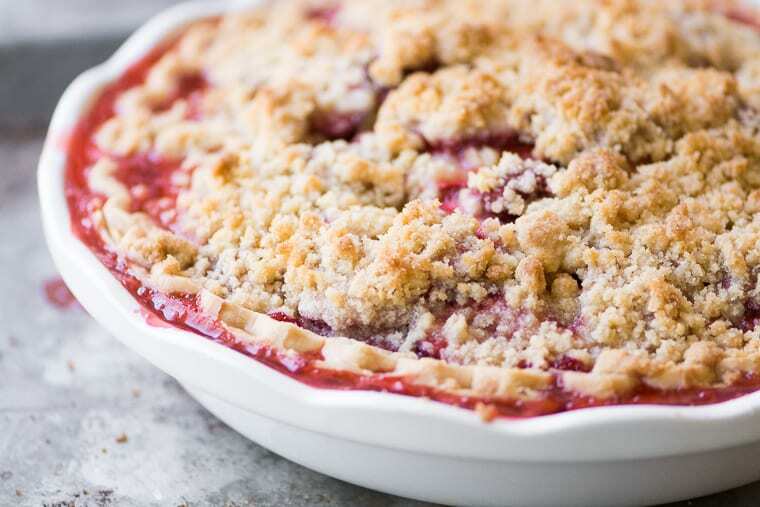 TIP: This easy pie starts with a frozen pie crust. (I like Marie Callendar’s) Carefully lift it out of its tin and place it into one of your own pretty pie plates. Once it bakes up, no one will be the wiser. Ok, so now you need your berries. Don’t bother to make this pie until you can get your hands on some good ripe strawberries, rock hard berries with white centers won’t do. I don’t hull them, I just slice them horizontally, discarding the green tops as I go. This pie is so simple because all you need to do after slicing the berries is make a quick butter crumble topping. You can use your fingers or two forks to cut cold butter into a flour and sugar mixture. It’s like playing in a sandbox. TIP: Like all fruit pies, the filling will shrink down considerably as it bakes, so pile the berries up high to begin with. The pie bakes up super juicy so do yourself a favor and place it on a baking sheet to catch any drips. TIP: Here’s a food stylists trick ~ just before serving, lightly sprinkle with a little extra brown sugar to ‘refresh’ the crumble topping and make it look even more appealing. 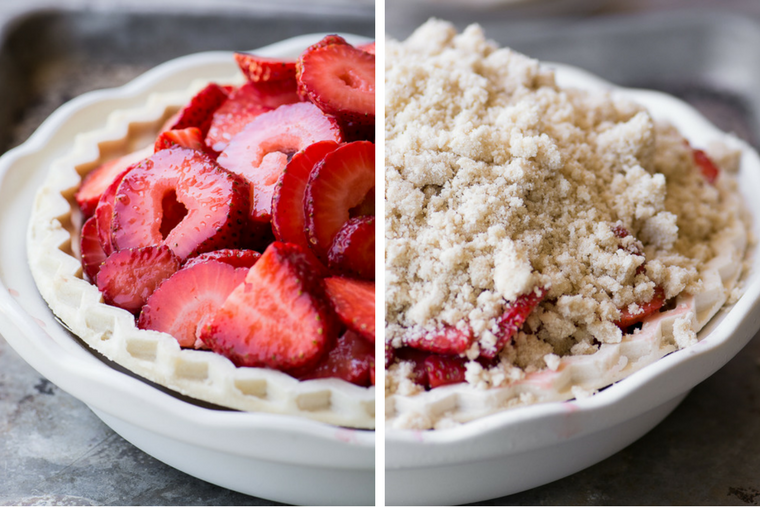 Strawberry Crumble Pie ~ this is one fruity, juicy, and berrylicious strawberry dessert you won't want to miss. 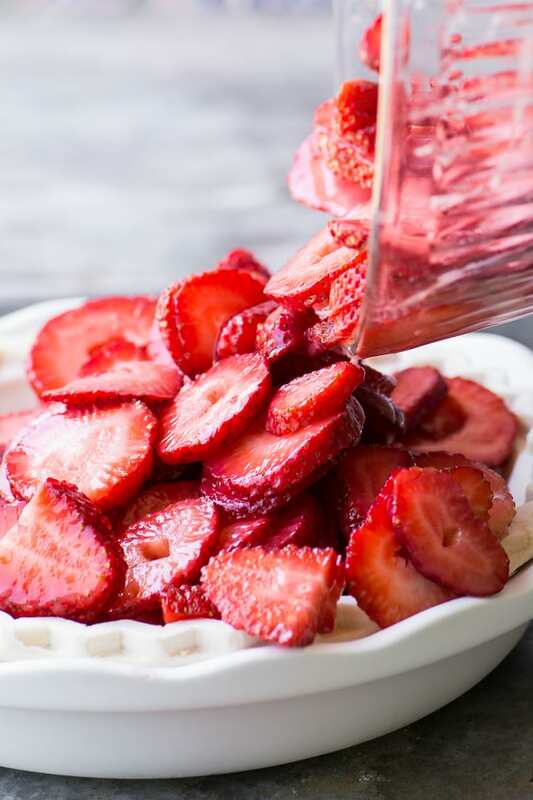 Toss the strawberries with the sugar, lemon juice, and cornstarch. Set aside. Make the crumble topping by cutting the butter into the flour and sugars. Use your fingertips or two forks to blend it all together until it becomes coarse crumbles. 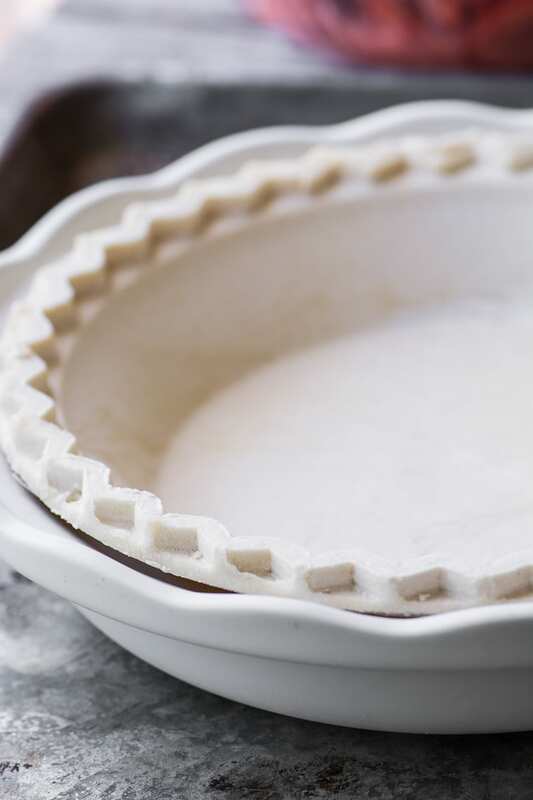 If you like, carefully remove the frozen pie crust from its tin and put it into your own pie dish. Set the dish on a baking sheet to catch any dripping juices. Transfer the berries to the pie crust, but leave any extra juices behind. Mound them in the center of the pie and top with the crumble mixture. Bake at 400F for 15 minutes, then turn the heat down to 375F for another 40 minutes, or until the top is browned and the juices are bubbling. When using frozen pie crusts, don’t thaw, just fill and bake straight from the freezer. If your oven runs hot and your crust starts to brown too soon, cover it loosely with foil. You can mix the strawberries with raspberries or thinly sliced rhubarb for a different flavor. Thanks for pinning this strawberry crumble pie! Wonderful pie recipe! I had tons of fresh strawberries and decided to make a “Fall” Strawberry Pie. So perfect and tasty. Had it with whipped cream My 86 year old mom loved it too! I wouldn’t have thought to make it in fall, sounds great! This is absolutely the best strawberry recipe we’ve Ever come across!! Thank you so very much for this wonderful recipe!! One question….does it need to be refrigerated? I usually leave pies like this at room temperature for the first day or so, and then, if there’s any left, I’d refrigerate it. But it will be fine for the first 24 hours. Do we eat this pie cold or warm? You can do it either way, Deisi, but we had it warm. It would be nice cold for a breakfast treat! Silly question, maybe, but I could do this without the pie crust, right? Would I need to change any of the proportions to just make it as more of a crisp? That’s a good idea, Emily, this would work fine as a classic crumble! I don’t think you’d have to change anything to do that. It wasn’t a hit in my house. It was too watery and I realized strawberries aren’t good when they are cooked. Sorry about that Sheryl. You might experiment with more thickeners next time, some strawberries are super juicy. And I know what you mean about cooked strawberries, they have a more ‘jammy’ flavor than fresh. Hope you try something else on my site!! Wow, that’s amazing, Chelsea, that’s more times than I’ve made it!! Anyone ever try this with individual tart shells? Would love to be able to cut down on the mess and plates when I take this pie for a pot luck. I just pulled the pie out of the oven and it looks and smells amazing! Thank you for sharing this super easy recipe! Could I use frozen strawberries? I’m afraid they might be a bit too watery, Kate. What does it mean to mound them in the middle of the pie? I just mean you can create a rounded pile, since there will be lots of berries…it will shrink down as it bakes, you can see what I mean in the photos. If you do not have lemons and can not go out to get any, how would that affect the pie? My daughter made this recipe last week and it was awesome!! The lemon juice is just to sharpen the strawberry flavor, Patti, it will be fine without it. Hi! Can’t wait to bake this – do you think it will work well with a refridgerated soft pie crust? Thanks! I don’t see why not, Melissa, but be sure not to add too much juice into the pie crust, and be sure to add your thickener. I am making this pie right now to take to a dinner party tonight. It smells amazing! Can’t wait to try it! Thank you for sharing! Such a dreamy strawberry pie! 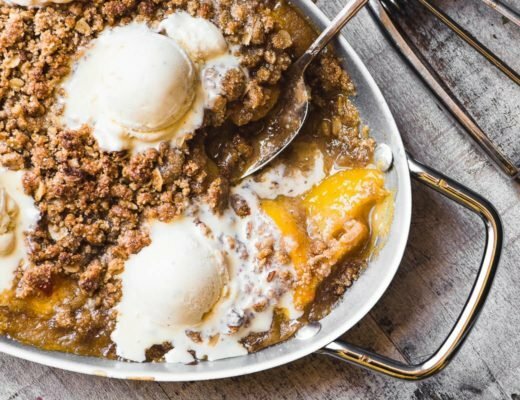 I’m in love with that beautifully golden crumble topping, too! Do you think I could use almond flour for the crumble? Absolutely, that would be delicious. Crumble is a favourite in our home and this definitely will be a hit too. This would make a great breakfast crumble, too, Angie ~ that’s the way my husband enjoyed his. This pie is delicious! For me the one hour of cooking was not enough. At that point the filling was still runny. After about 1.5 hours the filling had a much better, thicker consistency. It is delicious! I’m so glad to get such quick feedback Melissa :) I think ovens and strawberries can vary a lot, so it’s good to know that longer cooking worked for you. I’ve never made anything sweet with baked strawberries, it sounds and looks so good! I know, they don’t tend to be featured much in baked recipes ~ they have a delicate flavor when baked, and I think the flavor is intensified. Beautiful! And I’m so wishing I had a slice (or two) right now. I love how you’ve made this so simple Sue! I’m ready to play in the sandbox! What a perfect pie! So juicy, with a sweet crumble top – this must be perfection! I picked strawberries yesterday but need to go back for more. They still had tons of green ones on the vine. I NEED to make this beautiful pie! Picking berries is such fun ~ wish I could go with you! What a lovely looking pie Sue and the crumble on top looks amazing. I bet this is delicious! It just so happens I went to Costco this morning and bought STRAWBERRIES !!! Thank you for all your inspiration? Good heavens! That pie looks scrumptious!!! I happen to have a raspberry patch. I would think raspberries would work in the same recipe? And yes, I know what you mean about the print, I recently redesigned my blog and the print is a bit finer…I’ll look into that and maybe get it darkened up a bit. I have to say that looks like the best strawberry pie I’ve ever seen. I too love strawberries and cut them like you do! So much easier than hulling them. Great recipe! 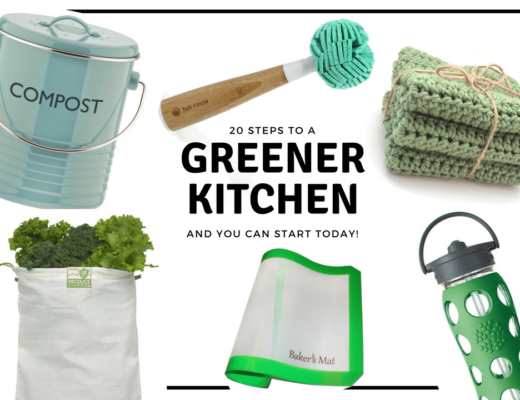 I can hardly wait to make it! Thanks for another fabulous recipe! I’m so excited for berry season, Sherri! I hope you enjoy it! Oh MY! I can just imagine this with a dollop of fresh whipped cream on top! This is a beautiful, tasty looking pie. Sue, this is perfection! I know exactly what I’m making once I’m off this stupid diet! I too use frozen pie crusts when I make pies. I would add some rhubarb to my pie…yummy either way. We’re loving all the great strawberries in the store at the moment! And I love pie any and every time I can get it. So of course putting the two together is my huckleberry. This looks wonderful — thanks. Huckleberry ~ now there’s a pie to look forward to!! 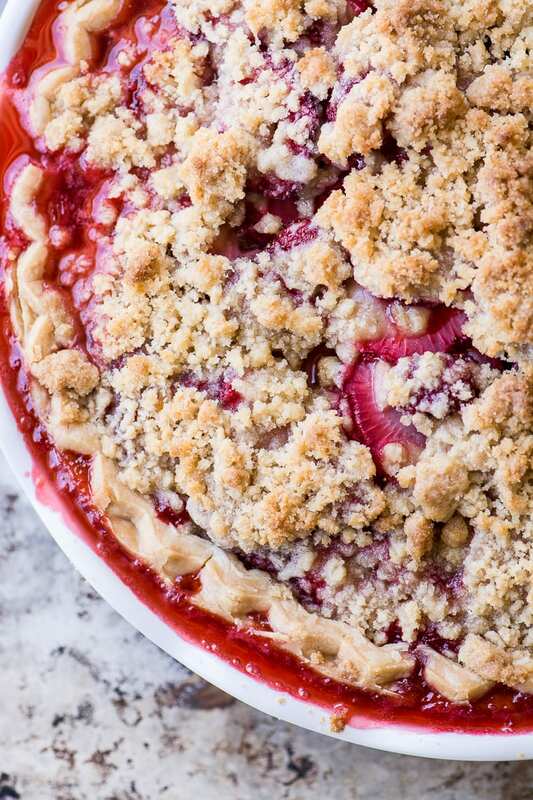 Strawberry pies are one of my favourites and I’m loving this one with it’s crumble topping (and easy, frozen crust :) Can’t wait for local strawberries here!